Nearly every city dweller nowadays is faced with a singular problem – how to arrange a comfortable living in a house or an apartment that barely has any space to answer for all the requirements. From time to time, we suggest you various means of decorating your small abode in such a way that it does not leave you feel cramped. Today we will discuss how to skilfully create a small study area in your home even if it is suffering from acute space crunch. A study room, which can double up as a library, is a prerequisite for every home. Yet, the due arrangements necessary to create a space where you can pursuit your work or learning at peace are sometimes made as an afterthought. This makes the job of organising a small space even more difficult. It is always better to plan ahead, if possible, long before you decide to purchase an apartment or start the constructions of a house. Even if you are not prone to such kind of mistakes, you may sometimes need little inspirations to find out and utilise areas within your living space which you did not think existed. Our today’s post will help you do just that. Let us see, what are the ways you can explore to integrate a study in your tiny dwelling. Proyecto decoración Plaza Euskadi. | Bilbao. The tradition of integrating a library in the living room is nothing new. You will just have to reapply the same to suit your purpose. Secure a corner of your living room to set up a small study. 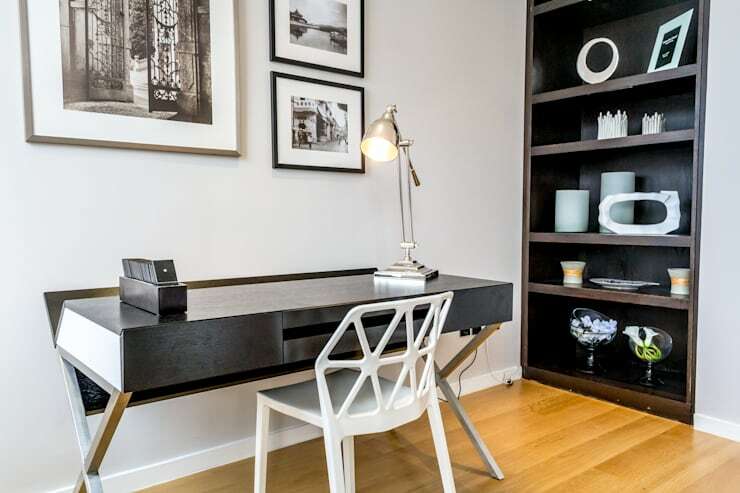 A simple study table with a comfortable chair are all that you would require to fit in this area. Wall mounted book cases offer best solutions for a small space. A table set in front of the window is an ideal placement, but if that is not possible you will just have to arrange adequate lighting to brighten up the area. 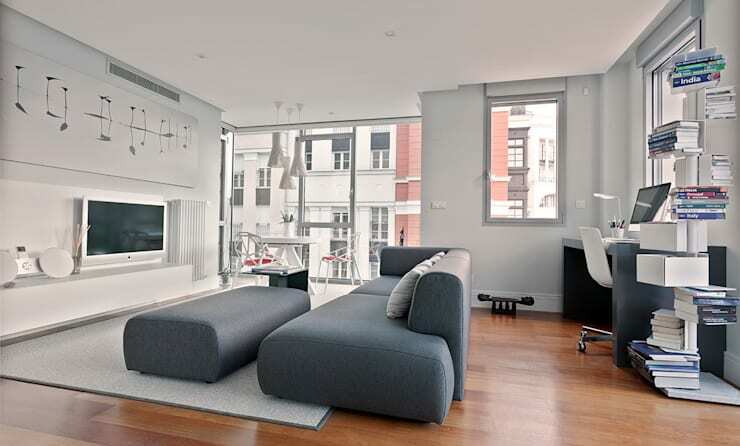 You may use this study of a Bilbao apartment designed by Urbana 15 as an inspiration for your home. 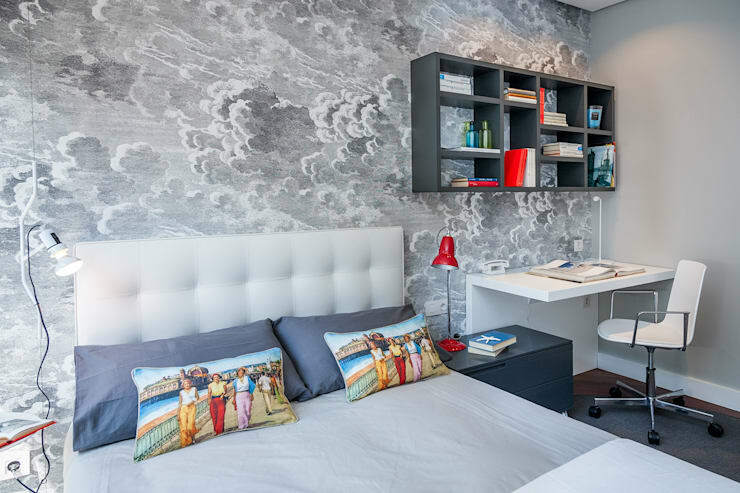 Setting up a study area by the bed is another option for you to consider. Make sure your furniture showcases a neutral shade or something equivalent to the wall colour to make it disappear in the background. 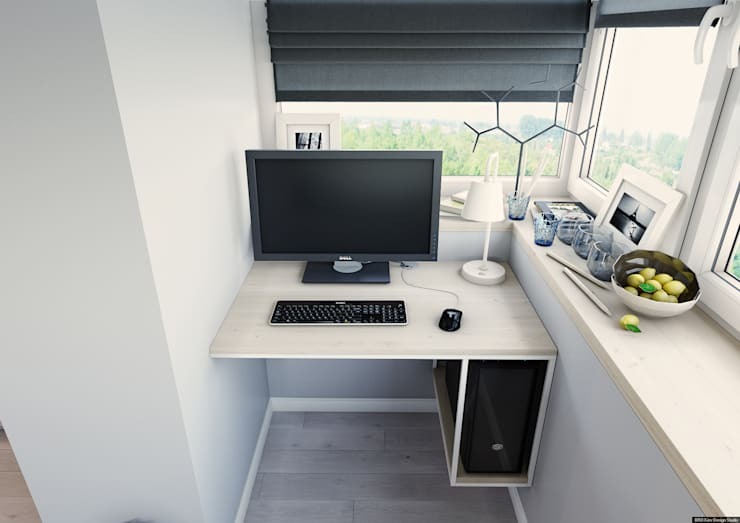 When space is a constraint opting for study room furniture made of transparent acrylic material can be a worthy consideration. If using traditional wooden furniture, make sure they are not creating any sense of clutter and reflect the décor of the rest of the room. This is generally not a consideration, but when space is a severe constraint you need to think of ingenuous solutions. You will have to prepare your balcony, terrace or varanda in such a way so that direct sunlight or rainwater does not cause any damage to your study room. Installing glass paned windows covered with blinds or curtains is one way of handling this. Treat the walls and the roofs to eliminate any concerns of dampness. Using damp free membranes, dehumidifier, extractor fans or climate control humidifier could be helpful. Once again, resort to minimalism while decorating the space. If the corridor or hallway, or at least a part of it, is reasonably spacious you can think of setting up your study there. You will have to resort to the same kind of window treatments for this part of the building too. When windows are nonexistent you will have to arrange appropriate lighting and ventilation to make more habitable for a longer period of time. Ceiling mounted spotlights, wall mounted lighting fixtures with adjustable arms or table lamps can offer flexible solutions. Ceiling or wall mounted fan, air conditioner etc can be installed to solve any concerns of ventilation. Explore the under stair space and see if you can possibly set a study room there. If need be, use bespoke furniture appropriate for this space. Use table or floor lamps to light up the otherwise dark underneath. Use white or pale yellow shades for the walls. This helps in adequately bouncing off the lights and create an appealing study room. Use lightweight wooden table or chair and install a bookcase if you can afford a space for this. Natural wood increases the warmth of the ambience. A combination of wood and treated aluminium or wrought iron can also be a good option for this area. A glass top table will look chic and prevent any creeping sense of clutter. Search for an unused nook in your home and set up a makeshift study there. You can use a foldable table while busy at work or in studies and remove it once it is done. Explore your entire living area to check from where you can extract a space like this. Do not exclude any possibilities including the landing of the stairs. Since, this is only going to be an area which would be in temporary use every day, utilise table and chair that are light weight and portable. Think of an artist working with an easel outdoors and build yours study keeping in mind that theme. May be you can pull a chair from the dining parlour or a stool from the living room. In such cases you will only require an appropriate study table. Select a vacant wall to put up your bookcase. Begin indulging in one of your favourite passions, namely, reading.